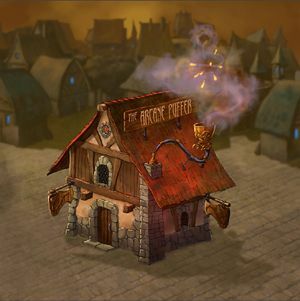 The Arcane Puffer is a magical Tobacco and Pipe Vendor in the town of Tinderbox. No wizard can be truly relaxed without an elegant pipe to puff on next to a cosy fireplace. The artisans at The Arcane Puffer carve elaborate pipes tailored to suit the character of each of their customers.